May 8, 2000 saw the unveiling of the central monument of the Martial Glory Memoriam in the town of Khimki, the Moscow Region – «HEROISM. MERCY. 1941-1945». The sculptural composition is by V. A. Yevdokimov, the architecture by V. N. Mikhailov, the artist A. S. Mustafin. The two-figure composition of the monument is executed in cast bronze and is erected upon a pedestal of red granite. The height of the monument is 5.5 meters. 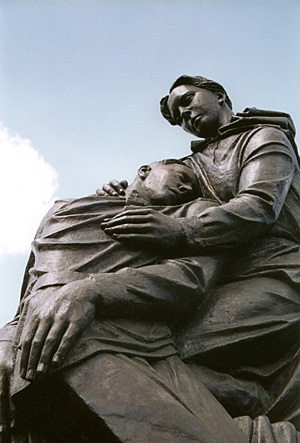 The composition diagram of the monument is based upon the classical Evangelical topic of Pieta – mourning. The heroic self-sacrificing and requiem are the two main succeeding events of the time of the war. The two transitions-contacts with the transcendental character of existence. The upsurge of courage and the woe of loss – are emotions that are not yielding to rational comprehension and that are determining the value of life and other vital values. A theme of a piece of art cannot be expressed adequately if the same feelings that must be expressed by the theme take no part in the creative process. So if war is the theme, then what takes place is the inevitable lowering of the tragedy to the drama that is accessible to artistic creation. The artist experiences the reality in his imagination and he is forced to create the harmonious cosmos of the artistic piece, which paradoxically imparts to the viewer the ability to come in touch with the chaos of the tragedy that was. The language of art must oppose simplification and commercial exploitation of facts of real life, for it is this fact, taken as art, fatally shields behind the true meaning of the event and carries the perception aside. In my work at the monument such a fact of reality could be provided by a literal following of the documentary photographic materials. At the same time, the real tragedy of the war had to accept organically the creative interpretation of the event – the spatial non-reality of the composition which originated in as result of bringing together the round sculpture and the relief in the wholesome plastic movement of the form. The paradoxical energy of the prostrate body of the soldier destroys the strictly frontal perception of the sculpture and finds a reserved rhythmical rapport in the figure of the woman-warrior. The struggle for the plastic merits of the piece, replenished with doubts and dramatism, has in fact turned out to be the struggle for ruthless accessibility of its true sense.